The following is a list of trips and events that EO has conducted with their partner homes and schools. Education Outbound teams up with the Dept. 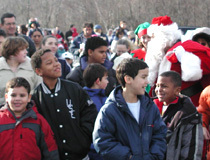 of Social Services to provide over 150 gifts to needy children at the Manchester Athletic Club in Manchester, MA. Article published in The Crickit . Education Outbound teams up with the Dept. 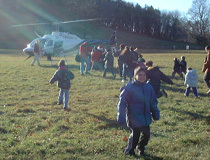 of Social Services to provide over 125 gifts to needy children at the Manchester Athletic Club in Manchester, MA. Article by Jenni Glenn and published in the MANCHESTER-BY-THE-SEA. 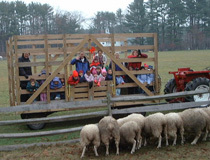 Inner-city children take trip to farm. Article by Lisa Capone and published in The Sunday Boston Globe. Story by Bill Woolley , Published in the Community Newspaper Company and the Hamilton Wenham Chronicle. 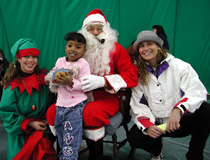 Education Outbound touches children's hearts for the holiday season, sponsoring an educational and exciting, surprise Santa visit to the Nashua Children's Home. The Telegraph, Sunday, December 24, 2000, Cathleen Genova.